On this week's episode, co-hosts Armand Rosamilia and Chuck Buda chat about various promotional tools to use as an author, touching on a few items to help you. 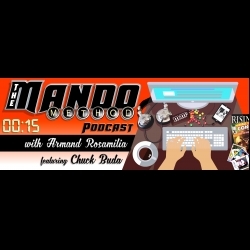 Then they wander about a bit and finally grow tired and end this week's The Mando Method Podcast. But not before Erin Sweet Al-Mehairi swoops in with her Marketing Morsels segment, talking about Instagram and how an author can use it to their advantage. The episode concludes with all of the hosts having a picnic and taking turns doing three-legged racing and dunking for apples.